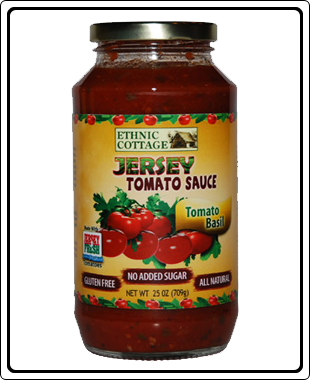 A deliciously prepared pasta sauce made with sweet tasting basil, flavorful Jersey Fresh tomatoes, pure Extra Virgin olive oil and a wonderful blend of fresh spices. Works well with almost any pasta and is excellent for seafood, poultry, and baked dishes like lasagna, eggplant parmesan, or as the base for a bruschetta topping. Ingredients : Vine Ripened Jersey Tomatoes, Onions, Fresh Garlic, Fresh Basil, Extra Virgin Olive Oil, Sea Salt, Fresh Oregano, Crushed Red Pepper, and Black Pepper.